Visiting national parks in the Czech Republic is another great idea of what to do on vacation. 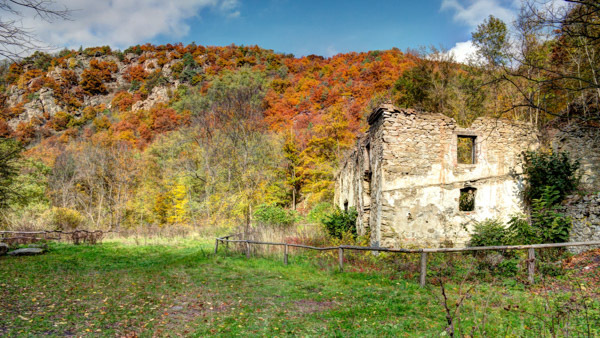 Besides, both tourists and local residents like it a lot and today we will speak about the smallest National Park in the Czech Republic – Podyji. It is located in the region of Znojmo, in South Moravia near the borders with Austria. 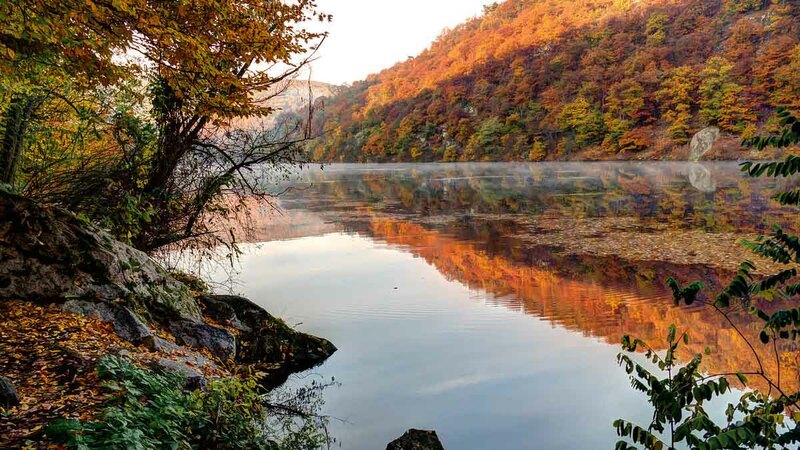 One of the main natural attractions of the South Moravian Region is the Podyji National Park. In total the Czech Republic accounts four national treasures like this, but Podyji is the smallest and occupies only 63 square kilometers. Here you can enjoy nature, preserved in its original form with picturesque valleys. It became a “nature heritage” in 1978 and later, on July 1 in 1991 the status changed to a “national park”. It adjoins to the Austrian national park “Tayjatal” and here flows the river Dyje. Interesting fact, that the total length of the park is only 15 kilometers, but the length of the river almost 40 kilometers. The difference in heights in the park is from 207 to 536 meters above sea level. The park houses 77 species of plants, including 18 species of orchids, 152 species of birds, 65 species of mammals, 7 species of reptiles (including three species of snakes), 32 species of fish, and 12 species of butterflies. One of the most famous sights of this place is Šobes. It is a huge vineyard with an area of 12 hectares. 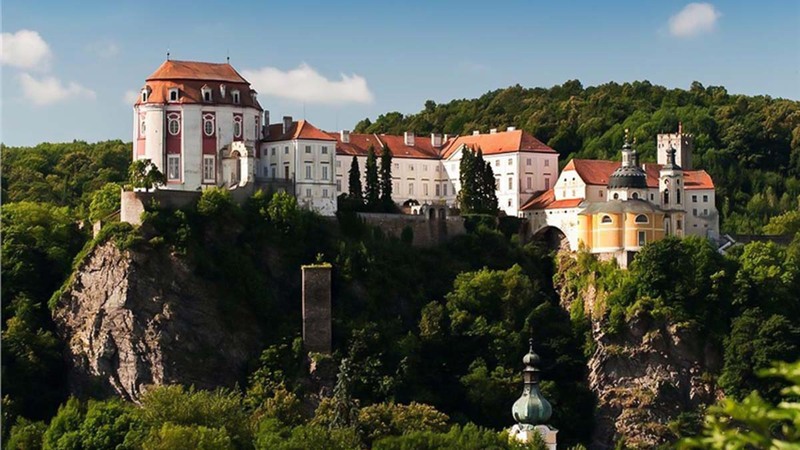 In addition, there is also the oldest castle Vranov nad Dyji, open to the public. Its building dates back to 1100, can you imagine that? Another famous attraction in the Podyji Park is the Lusthaus hunting palace (Lovecký letohrádek Lusthaus). It was built in 1780 in the form of an irregular hexagon in the style of the late Baroque and partly classicism. 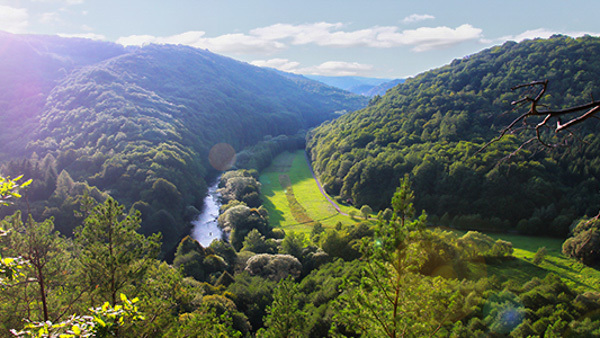 Moreover, you can admire the magnificent views and take photos of unique nature from the top of the Silfield stone – the rock, located on the right bank of Dyje. There is also the so-called Stone Sea, which is a vast area of stone blocks of various sizes that arose from the work of wind and time. In the Podyji national park you will see numerous cycling and hiking paths. Therefore, you can admire this beauty and have an active rest for the body and mind here. The most interesting places are equipped with panels with information about the natural resources of the national park and its map. Even though Podyji is the smallest national park in Czechia, it is fairly difficult to cover it by foot. 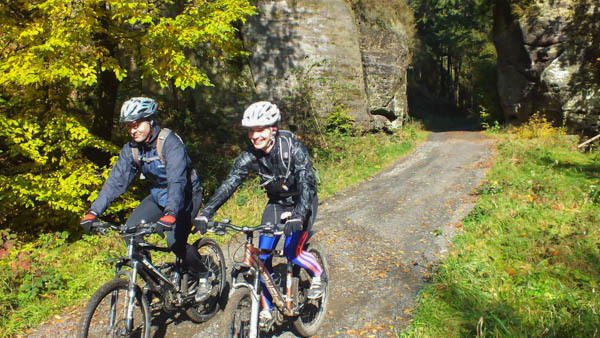 For those who love active time spending, Czech tourist club organized nice bicycle routes throughout the park. All of them are marked with direction indicators and have signs with information. This is probably the best way to discover its amazing nature, stunning castles, villages, chateaux. If you want to go further and get more emotions, there are also horseback excursions available. The park has two horse-riding trails covering various sights. All of the necessary information you will find at the entrance to Podyji national park. 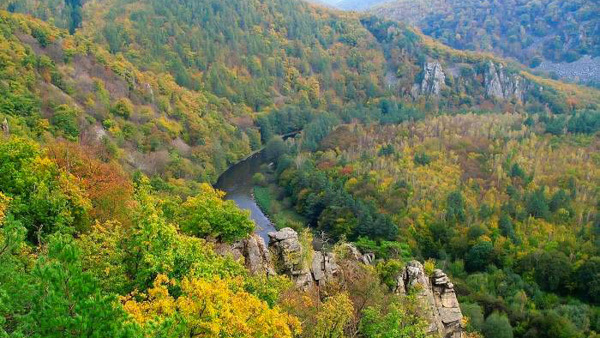 You can get to this national park Podyji from the city of Znojmo. Going from Prague, take a bus line 060 from the station Florenc. The trip will take about 3-4 hours and the ticket price is about 7-9 € (200-250 CZK). In addition, it is almost impossible not to look in the window on your way there, because the nature is really magnificent. Then continue your way by taxi. There are no direct trains from Prague to Znojmo, so you will have to change trains in Breclav city. Trains from Prague departs from main station every 2 hours. However, the route will take approximately 5 hours. More info here – Czech Railways. This is probably the best way as you will cover the distance of 203 kilometers from Prague only in 2.30 hours. Follow the D1/E65 route to 38 route. If you are the first time in Czechia, consider using navigation. There are four national parks in the Czech Republic, great for those who like to enjoy long walks. If you are one of these travelers, include it into your trip to Czechia. Moreover, you can do it in a company of our experienced local guide, who will help you to grasp it in full! 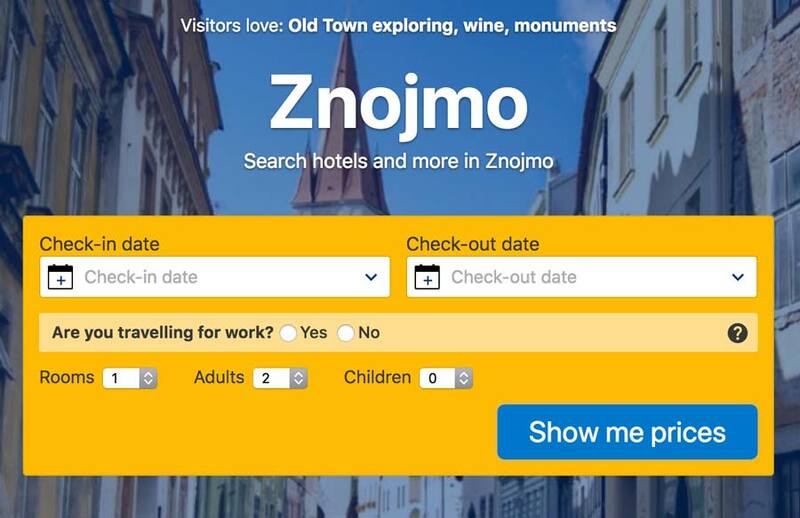 Znojmo is a lovely place to stay overnight, so I’ve picked up the most comfortable and reasonable places to stay on your way to Podyj Park. Visiting Podyji gives a unique opportunity to get acquainted with the beauty and natural riches of Czechia. Bright picture in front of your eyes, rare representatives of flora and fauna, deep forest and majestic rocks - all this year round attracts many lovers of nature. 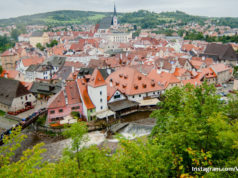 Why are Cesky Krumlov and Hluboka nad Vltavou so attractive?